Today we commemorate one of the most influential events in South Africa’s history. On 9 August 1956, 20 000 women marched to the Union Buildings in Pretoria to protest against the carrying of passes by women—which severely restricted the movement of women across the country—as well as a host of other repressive legislation. The march was led by four extraordinary women: Lilian Ngoyi, President of the Federation of South African Women (FedSAW), Helen Joseph, a founding member of FedSAW, Rahima Moosa, organiser of the Congress of the People, and Sophia Williams De-Bruyn, founder member of the South African Congress of Trade Unions. 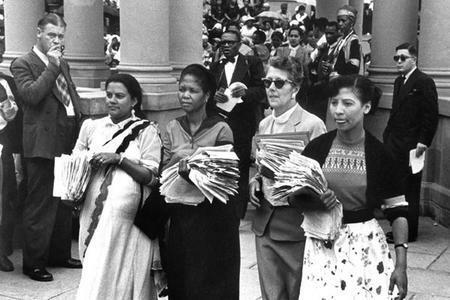 The four leaders united behind them thousands of women who descended on Pretoria from all over South Africa to present petitions against the carrying of passes by women to then prime minister, Johannes Gerhardus Strijdom . Strydom was not present at the Union Buildings to accept the petitions, which included approximately 100 000 signatures, so they were handed over to the prime minister’s secretary. When the four women returned from the offices, they entered the Union Buildings amphitheatre where thousands of protesters were waiting under umbrellas to hear the outcome of the handover. In a show of strength and solidarity against the prime minister’s absense, the women stood in silence for 30 minutes and then sang the newly created freedom song Wathint’ abafazi, Strijdom!, which later became a powerful song and slogan that translates into You Strike a Woman, You Strike a Rock! The 1956 march is noted as one of the largest and most influential demonstrations of the Apartheid era. Most women travelled through the night to take part in the march and many risked losing their jobs by joining it. Incidents of intimidation were reported on the day, with Apartheid police stopping trains and buses en route to the Union Buildings. Despite all attempts to silence the women, the turnout on the day far exceeded the expectations of the organisers. African National Congress Women’s League (ANCWL) member Albertina Sisulu was one of the co-organisers of the march while Amina Cachalia, first treasurer of FedSAW, raised transport funds for the march through cake sales and other activities. Bertha Gxowa, another FedSAW founder member travelled with Helen Joseph in her small Volkswagen around the country in the weeks leading up to the march to collect the petitions that eventually would make it to the Union Buildings. Although there were numerous popular women figures throughout the planning of this march, there were many others, including Annie Peters, Caroline Motsoaledi, Fatima Meer, Fatima Seedat, Florence Mophosho and Letitia Sibeko, who played a significant role. They were involved in the extensive planning of the demonstration and encouraged women from all walks of life to sign the petition and take time off to support the march. The 9 August is an historic event that represents the courage and strength of South African women, and is an example of the power of unity across all racial backgrounds in a racist society. It depicts how women challenged the laws of the Apartheid state, and beyond that, challenged prevailing gender stereotypes that up until then judged women as a support act to the many causes being fought. This Women’s Day, we honour three of the four leaders of the 1956 Women’s March: Lilian Ngoyi, Helen Joseph and Rahima Moosa, all to be found in the #LongMarchtoFreedom. The Long March to Freedom at Fountains Valley is open on all public holidays. Tour guides are on site from 11:00 to 16:00. Next Next post: WELCOME Ekukhanyiselweni Christian School!! !